Built by Harland and Wolff in 1870, the SS Atlantic was White Star Line's second ship. With both four sail masts and a single prop steam engine, she was able to cross the Atlantic in a much faster time than most other ships of her time. Assigned to the Liverpool, UK - New York City, USA route, she helped bring immigrants from Europe to their new lives in North America for three years. Then, on her 19th voyage in 1873, her career came to a tragic and abrupt end. Her journey on this trip had been tough - rough March weather had tossed her around for three days. This resulted in her coal stores being depleted more quickly than usual, and caused Captain James A. Williams to make a change in plans. He decided to head for Halifax to top up his coal, and then steam straight for New York. The Atlantic had 952 souls on board, and of those 835 were passengers. These included many women and children and two babies who were born during the crossing. As she approached the unfamiliar Nova Scotian coast, the crew believed themselves to be on course. In fact, they were 20km too far west, heading for the small fishing communities of Lower Prospect and Terrence Bay. At 3:15am, still in terrible weather, the SS Atlantic crashed into the rocks off Marr's Head, Meagher Island (now Mars Head, Mars Island). As quickly as the passengers were awakened, they started coming up onto the deck. The crew struggled to lower the lifeboats, but a large wave washed the port side boats away and smashed them into the shoals, and the starboard boats quickly became useless as the ship began to list to port. Passengers and crew alike had to leap from the vessel and swim for the nearby rocks, many becoming lost in the pounding surf. Those who didn't make for the water tried climbing the masts as the stern sank beneath them, with only a few having the strength and agility to make it. Some managed to make it to a nearby small rock island, while others crawled onto some of the larger rocks. Similar to the story of the SS Ethie, it was the nearby communities that came to the rescue. 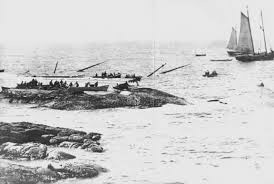 Notified of the crisis as the ship began to slip under the waves, the men took to their small boats (dories) and rowed to rescue those who were clinging to life on the rocks and the deck of the foundering vessel. Over the next few hours, those who had survived the pounding surf, floating debris, and freezing temperatures, were taken from the wreck and to nearby homes where they were cared for. A messenger was sent to walk into Halifax to deliver the news and acquire more help. In the end, all of the women who had been on board, and all the children except for one, were lost. The exception was a lucky 10-year old named John Hindley, who had been staying with his brother in the single men's accommodations that night. Had he been with the rest of his family amidships, he would have not been so fortunate. Of the 952 souls on board, 535 were lost. Only ten of those were crew. In the time that followed, an inquiry was held and Captain Williams was blamed for the incident. It was considered that he had been going too quickly into unfamiliar waters, and did not have a detailed chart for the shoreline so was unable to accurately assess his location. The SS Atlantic disaster remained the worst maritime disaster until the wreck of the SS La Bourgogne 15 years later, and would remain the worst loss of life for White Star until the wreck of the Titanic in 1912. The most tragic part of this story is that not a single woman was able to be saved. Many mothers plunged into the icy Atlantic waters holding their children and making vain attempts to get ashore. The single women's cabins had been in the stern of the vessel, which was the first section to become submerged, giving none of them a real chance. The result of this was the now famous adage "Women and children first", created to insure that such a loss of life would never happen again.